So how is March coming in where you live? We have had a milder than usual winter here in middle Tennessee, which is fine by me. We typically have a small snow or two and maybe an ice storm here and there, but we have had virtually none of either this year. We do however tend even in mild year’s to have one last push of winter around the first week of March and this year was in keeping with that tradition. Over the weekend we have a drop in the temperature to some of the coldest we have had this winter, daytime high’s near freezing and overnight low’s in the upper twenties. Along with this we had a dusting of snow and flurries. Fortunately the ground was too warm for it to last even the day. Hopefully that is all there will be of winter weather and March will have “come in like a lion and gone out like a lamb”. On to the knitting progress. I have been working exclusively on the Merino Bamboo baby dress since my last post and have completed the body portion already. 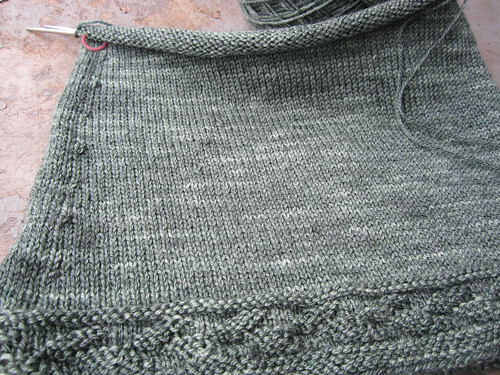 I am planning to get the sleeves done and start the yoke today. 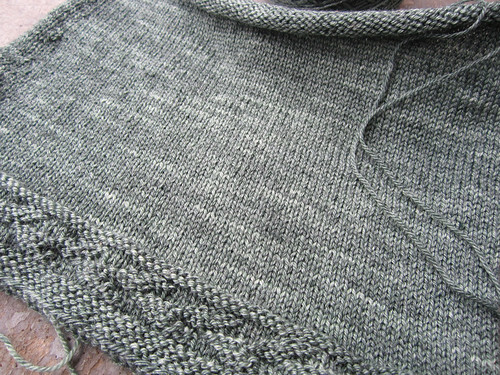 I am not sure if I will get enough knitting time to get that much done, but I am hopeful since the sleeves will be short and shouldn’t take long at all. Sorry for the picture quality today. The color is actually a bit more green than gray but it is rainy this morning and I was too lazy to drag out the light box.